So I’m a bit late to the #10yearschallenge but like to think I haven’t changed much! I’m still messing about in the woods, and I still regularly wear my blue @finisterreuk jacket! 2009 photo was taken by my Dad, borrowing my Canon 50mm lens. Recent photo was an iPhone selfie. The 2009 photo was taken by my Dad, we had spent Christmas in Perth, there was so much snow that the road to Glenshee was closed, so instead of going snowboarding with my brother, I went on another photo walk with Dad – we had already been out on Christmas day. The photo was one of a series my Dad took of me on Moncreiffe Island, in the middle of the River Tay in Perth, however this one is my favourite – it was the one I used on the online auction dating profile where Jen found me! I still regularly wear the blue Finisterre jacket, even if it looking a bit tired now. It is still a great jacket and I think I will be buying a new one in 2019. The recent photo was an iPhone selfie on a local bike ride back in November. I remember the light in Tile Hill Wood was perfect, so I just had to stop for a photo! This was back before I had sorted out my MTB photography kit, but fortunately even the front camera on my iPhone 7 works well with good light. From looking at the two photos I do not seem to have changed much, I am still have the same stubble and am messing about in the woods. However, in 2009 I was in the woods in Scotland because after travelling up there I could not go snowboarding. In 2018/9 I cannot even remember the last time I thought about snowboarding, mountain biking has well and truly taken over! Another thing that I realised has changed is that I have not been out with my Dad on a photography adventure for a long time – something that I need to address in 2019! At first glance the photo above may just look like a snap of my hardtail mountain bike, like many I have taken over the last few years. Look closer, and you will notice the magical Fuji Velvia colours and the shallow depth of field, giving away that it wasn’t captured on my iPhone, but a proper camera! Getting out for a bike ride with my camera was one of my goals for 2018 (a failed goal carried over from 2017) and part of the reason behind my switch from Canon to Fuji cameras. The final pieces in the jigsaw were getting the Fuji 23mm f2 prime lens, which is smaller and lighter than the “kit lens” and a Lowepro SH 110 II Adventura camera bag, which was the smallest camera bag I could find to fit the Fuji X-T2 and 23mm f2 lens combination. This set up weighs just under 1kg and fits in the top of my hydration pack. After clocking over 5,000km on my Vitus Nucleus hardtail, I decided it was time to treat it to some upgrades. The original Suntour fork was a weak point in the spec, and was past its best. So when I spotted a great deal on the same Fox 34 fork as I have fitted to my Orange Four I had to buy them. They weren’t a straight swap onto the bike, meaning I had to replace the front wheel. I had planned to upgrade the wheels on my Four, then fit the old front wheel onto the hardtail. However, I spotted a stupidly cheap front wheel online, so ordered that. Although it meant I didn’t get the nice new wheels on my main bike, the total cost was a fraction of what I would have spent. I already knew the new forks would be good, due to my experience with them on the Four, but what I hadn’t expected was how much lighter they are than my old forks. I tried to pop a manual (rolling along on the back wheel only) and the front end came up so easily that I almost went over the back of the bike. You may be wondering why a new fork and front wheel are v1.2 and what happened to v1.1… Shortly after getting back from honeymoon, and three quarters of the way through my 2,015km in 2015, the original low end 3×9 drivetrain was pretty worn out. As it was clear that mountain biking wasn’t just a passing phase I decided to upgrade to an XT 1×10 set up – not quite top of the range, but still high end. At the same time, fed up with repeated punctures, I fitted the “Protection” version of the Continental X King tyres and set them up tubeless. These upgrades cost roughly the same amount as the whole bike had the previous year, however they totally transformed it. The drivetrain was significantly smoother, the bike lighter and crucially, more reliable. I had three years with the bike in this v1.1 configuration. Riding it on local trails, at trail centres, pumptracks, training rides and the odd commute, the bike felt much better that the sum of its parts. Since fitting the new fork I had done a few local shakedown rides, but with my Four out of action, after I smashed the rear mech on a log last week, I used the hardtail for my big Sunday ride. I decided to do my Kenilworth loop, a mixture of single track and bike paths, to Kenilworth and back. Before I stopped working on Fridays, this was my regular extended commute. I hadn’t ridden it for a while, so thought it would be a good test of the new fork. Even just rolling down the lane behind the garage the bike felt amazing, it seemed to carry speed better than the full suspension bike. I expect this is down to the faster rolling tyres, but the lack of suspension won’t have hurt. Normally on this route I ride straight through the middle of Park Wood, but this time I decided to add in a full loop, to test the bike on the downhill sections. It felt good, really good. Checking Strava when I got home, I’d got my second best time ever! When I got to Kenilworth I did a lap of my old Friday interval session – up Coventry Road, down the Common bridleway and back up the Greenway, taking it easy on the flat bits in between. I shocked myself by how easily I got up the hill on Coventry Road. I still remember struggling up it a few years ago, but now I was even able to climb it fairly quickly and I don’t think that was to do with the bike! I was really enjoying riding the hardtail, until I got to a bit of trail, that I’ve only ever ridden on my Orange. It isn’t a frequently used section of trail, and was quite bumpy – not something I’d ever noticed on my full suspension bike. I don’t know if I was tired, after pushing on earlier in the ride, or if it was the bumpy trail, but I just couldn’t get any flow. In contrast to the rest of the ride I felt so slow. I see this as a challenge for next time I ride that trail on the hardtail. Later in the ride, I managed to equal my personal record on the “Milk Bar Trail”, a fun little trail in Earlsdon that I’ve ridden almost 100 times according to Strava. I wasn’t sure if I should be pleased with my time, especially as the trail has got harder since setting my best time, or if I should be annoyed that I set the time on my old hardtail, rather than my “good bike”. Brakes – The original Tektro brakes aren’t great. It could be that they need a good service, but they are much harder to work on than the Shimano brakes on my Four. I expect that when I see a good deal on some Shimano brakes I’ll upgrade. Lack of dropper post – Going from the Four to the hardtail I don’t miss the rear suspension, but I do really miss the dropper post! Being able to get the seat out of the way makes it easier to move your weight around the bike for better control over technical terrain. It also makes it easier to get on and off the bike. On the Four I just press a button on the handlebar to change the seat height, or the hardtail I have to physically swap seats/seat posts depending on the sort of riding I’ll be doing. Unfortunately this isn’t something I can upgrade easily. 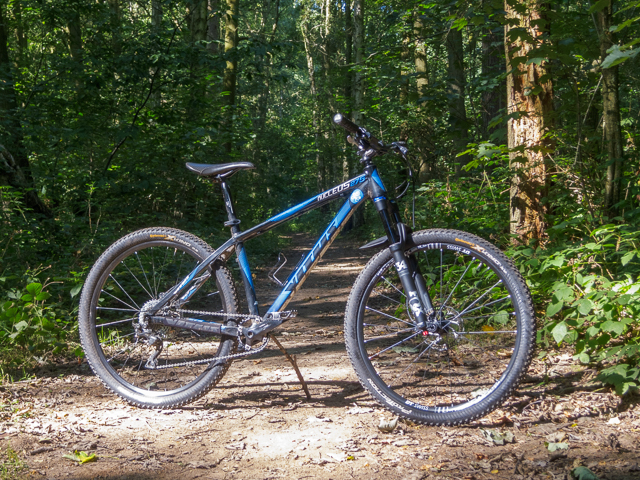 Fit – The biggest problem with the hardtail is that the frame isn’t quite long enough. Even with a layback seat post (which is one of the reasons I can’t fit a dropper post), I feel like I’m sitting over the back of the saddle. This won’t be an easy fix, fortunately most of the parts on the bike will transfer over to a new frame. 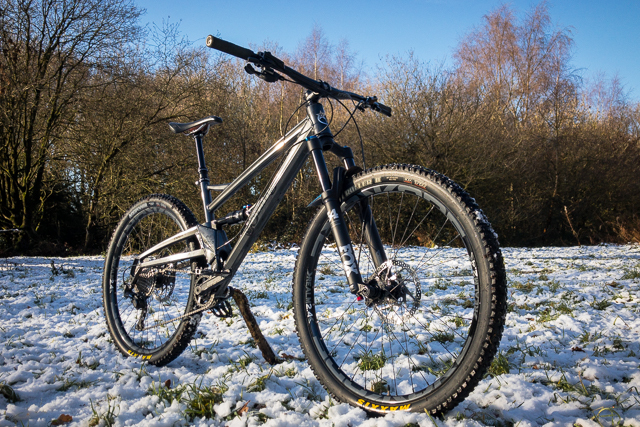 Realistically I’ll have at least this winter to ride v1.2 of my hardtail, before building v2.0. I will be making sure I take it out on the trails, rather than just using it for more mundane rides, because with the new forks it is such a fun ride! Today was the annual British Cycling Let’s Ride event in Coventry, and it couldn’t have been any more different to my ride with the Orange Riders last week! 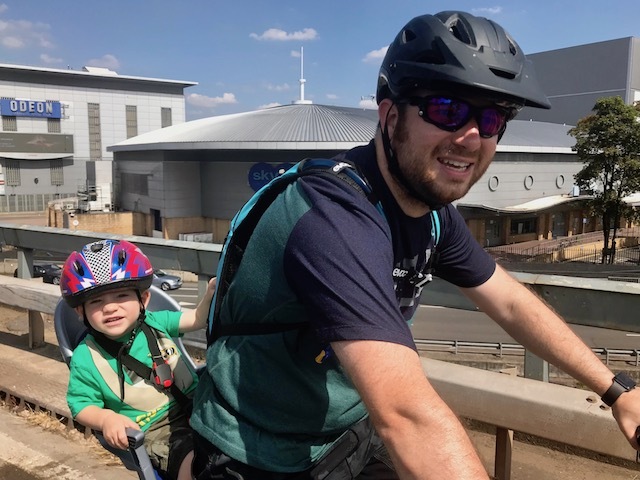 It is a family ride around the Coventry ring road, with a festival atmosphere in the city centre. Most importantly, it wasn’t raining! It was a warm sunny day, I was dripping with sweat after returning from a short warm up ride, on my Orange Four, to clear my head after a stag do the previous evening. Both Jen and Owen joined me for the Let’s Ride event, although Owen was on the back of my bike, rather than on his Strider. We rode to town via the woods on Hearsall Common, Owen was disappointed not to see any dogs, after seeing loads up there a few days ago. We joined the event outside the Transport Museum, where they had a fun looking track for kids to ride round and a more technical track for a mountain bike trials demonstration. We watched the trials riders for a bit, they were impressive and made me want to work on my basic bike handling skills. They were balancing their bike stationary on a thin rail, I can’t even stop at the traffic lights without having to put my foot down! We set off round the event route on the ring road, and it was good being able to see all the places we usually whizz past in the car. Owen was particularly excited to see all the construction equipment on the building sites. After half a lap of the ring road, the route took us back into the city centre, to the festival zone on Broadgate. We picked up our event vests, but didn’t hang around as it was pretty busy and we were getting hungry! In a change to the route from last year, we actually rode through the ruins of the old cathedral, before dropping on to University Square, which was the street food area. I was initially disappointed to only see three vendors, until I noticed that one of them was The Flying Cows. These guys make the best burgers I’ve ever tasted, and I have tasted a lot of burgers! Their “Flyer” burger has also been crowned best street food burger in the UK. Jen and I both had burgers, which were utter perfection. Owen even had a few bites, and he’s never shown interest in burgers before. He also had a massive hotdog from the stand next door, and did really well eating it. I had a bite or two and it had a strong smoky taste, almost like a peated whisky, I was surprised that Owen ate it, as he can sometimes be fussy. There was also a churros stand, so we had to share a bag of those too, even if it wasn’t really churros weather. We’d found a shaded spot to sit to eat our lunch, and it was good to just hang out watching everyone riding past. Owen enjoyed climbing the steps and watching the skateboarders too. 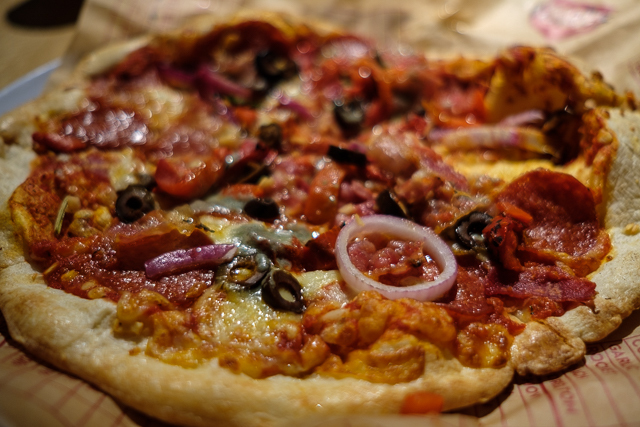 With full bellies, we got back on the bikes and rode through the university and back onto the ring road. Owen and I took part in the “Sir Chris Hoy Speed Challenge”, we must have gone pretty fast, as Jen didn’t see us and we had a long wait for her to catch up. Our speed was 19mph, which I was pleased with, bearing in mind it was on the flat, from a standing start with Owen on the back of my bike. Before returning home, we did another half lap of the ring road, back to Broadgate. Riding round I was impressed at how many people were out enjoying bikes, but especially some of the kids who were probably only a year or so older than Owen and riding really well. Hopefully Owen will be up to riding it himself if they have one next year! The Beast From The East/Snowpocalypse struck the UK last weekend and although Coventry seemed to get off fairly lightly my plans to take the MR2 on track at Silverstone were scuppered, but we still managed to have a good time without leaving Coventry! Since returning back to work after paternity leave, my weekend starts on a Friday, usually with Owen’s swimming lesson in the morning. Driving to the pool, the roads were actually clearer than they had been on the previous evening’s commute – where I witnessed a car leave the road in front of me. Owen enjoyed his swim, but was a little monkey when he got home. He was probably getting cabin fever, as he’s spent most of the last week at home, as he had picked up a stomach bug at nursery and we didn’t want a repeat of our trip to Yorkshire last year where he passed on his bug to everyone he met! Unfortunately we couldn’t get out to play in the snow, or even work on bikes in the garage (which Owen loves), as it was just too cold and windy. So we lit the fire, settled down in the lounge and waited for Jen to get back from work. Fortunately the wind had died down by Saturday morning and everywhere looked lovely covered in a thick blanket of snow. Jen’s Parkrun was cancelled, so we were able to run some errands, before getting Owen into his snow clothes to play in the garden. 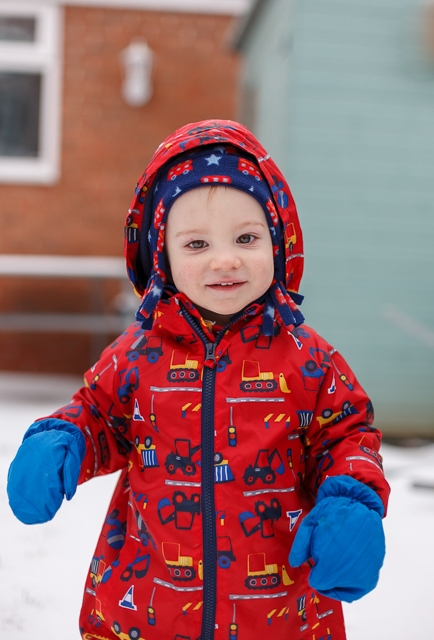 This wasn’t the first time Owen had played in the snow, and he was excited to get out in it. He really enjoyed himself – especially throwing snowballs! He also copied Jen making a snow angel, and loved crawling around in the deeper snowdrifts in the garden. Playing in the snow tired Owen out, so while he was having his nap I managed to get out on my bike. It was only for a short ride around my local trails, but they were transformed in the snow and I couldn’t help but smile at the sound of fresh snow under my tyres. I am used to the trails I ride most weeks changing with the seasons, but it is usually a gradual change, rather than an overnight change with the snow! I also liked being able to follow other tyre tracks and seeing which parts of the trails other people were riding. The snow had started to melt by Sunday morning, so we went out to Hickory’s Smokehouse for breakfast. All of the playing in the snow must have made Owen hungry, he polished off most of his fry up – we’ve never seen him eat like that! Whilst Owen was sleeping off his breakfast I went out on my bike again. The snow on the trails had mostly turned to slush and mud, so it was tough going. I ended up having to abort my ride and ride home on the road as I ran out of time. We spent the afternoon visiting Jen’s mum and dad, looking at photos of Owen – it is amazing how much he has changed, even over the last six months. The weekend hadn’t gone to plan, the weather was rubbish, but we still managed to have a good time. I was rested and ready to hit the ground running when I got to the office on Monday morning, which was useful as work has been really busy over the last few months, hence the lack of updates to this blog. Things should be retuning to normal soon though. With the festivities out of the way, and no update on even when I’d get the results from my MRI, I decided to head out for a gentle local ride. The only slight problem was that snow from the day before was still on the ground and there had been a hard frost. However, it was a lovely sunny winter day and it would have been a shame to waste it by staying inside. 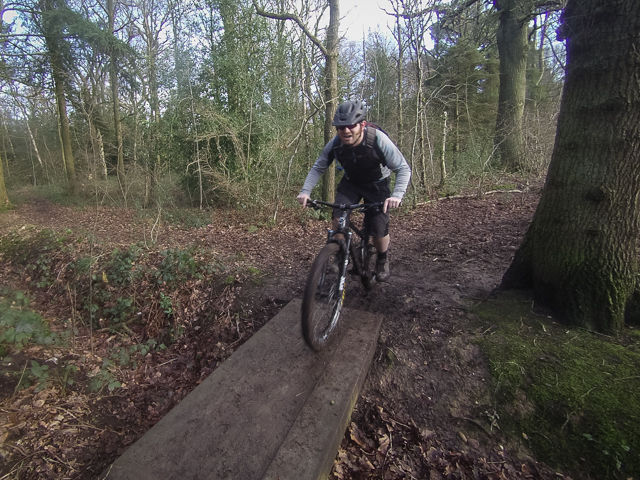 Usually I would have taken my old hardtail for this sort of local ride, but despite having had six weeks to work on it, it was still in bits in the garage, awaiting some spares – but that is a whole other story. In any case my Orange Four was probably more suitable for this particular ride, with suspension to reduce the stress on my knee and knobblier tyres for the muddy trails. Who cares if I was totally over-biked for a gentle ride around the city! It felt good to be back in the saddle, even just riding along the lane behind my house, crunching through frozen puddles. However, I knew the first real test would be the climb up the bridleway next to the Co-op, known as “Dog Poo Alley”. As I got into the climb I could feel a slight reminder from my knee that it wasn’t right, but I wouldn’t describe it as pain. I was more concerned by my legs and lungs! A combination of six weeks off the bike, freezing temperatures and lack of warm up before a climb meant that both my legs and lungs were burning – on a climb I usually breeze up! 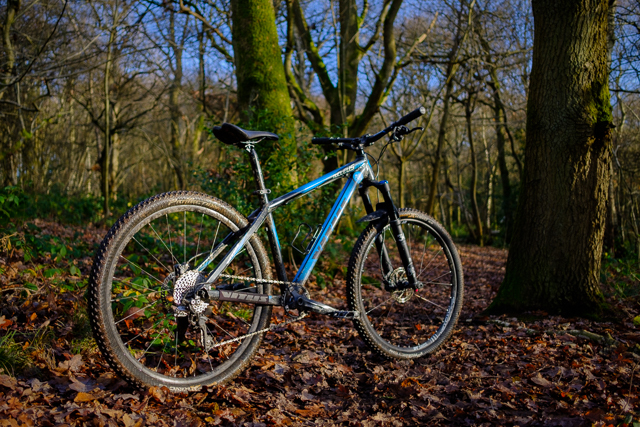 The low winter light coming through the trees in Hearsall Woods necessitated a stop for photos – I still need to get my Four into the GMBN Bike Vault with my Vitus hardtail. I then had the brilliant idea to check out a clearing in the woods, which I hoped would still be covered in snow – as you can see from the photo at the top of this post, I was in luck! Riding away from the clearing I found a fun bit of trail with roots and berms – I couldn’t believe that I’d been missing out this section for years. The next section of my ride was uneventful. At Canley Ford I opted to miss out the “Milkbar trail”, as it is quite rooty and twisty, so I stuck to the tarmac lane. My plan had been to ride round the Memorial Park, as an easy way to add some distance to the ride. When I got there the perimeter path looked like an ice rink, so I decided that the muddy trail through the woods would be safer. I haven’t had much luck with this section of woods this year – a tree fell onto the main trail in the spring and thus far I haven’t found a way through without having to get off the bike and climb over fallen branches – this ride was no different. After crossing the Kenilworth Road, I resisted the temptation of the dirt jumps and followed the trail to Earlsdon Avenue South, where I had to stop for a breather. I was really feeling the six weeks I’d had off the bike. From there it was road to Hearsall Common, where I had fun breaking through the ice on some frozen puddles – something that never gets old. Then back through Hearsall Woods and down Dog Poo Alley. As I was near the end of my ride, I decided to drop my seat and really push on the pedals to see how my knee would react. It coped, but it wasn’t happy about it, most of the ride my knee felt fine, but when I was standing on the pedals it didn’t feel right. It didn’t hurt, but it was more a reminder to not push things too quickly. I rolled back home, covered in mud, but happy that my knee had held up and that I’d survived the icy conditions. It is also good to know that my knee is recovering, I won’t be heading back to Cannock Chase to conquer the rock garden that caused the injury for a little while, but hopefully I should be able to get out and rack up some base miles to get my fitness back to where it was at the start of November. Spring has sprung in Coventry! I took this photo on a walk around Allesley Park, near home, whilst waiting for some paint to dry on the 119 Project.